Doug McClure descends to the Seven Cities of Atlantis in this cleverly written adventure. Cinema Club R2 DVD. With the change in management, this fourth fantasy film was no longer based on the Edgar Rice Burroughs' novels that had serviced the previous films, Warlords of Altantis is an original script from screenwriter Brian Hayles who had previously worked on the BBC's sci-fi series Doomwatch and Doctor Who (the original writer of the Ice Warrior serial Seeds of Death (1969)). Styled in a similar Victorian era adventure tone to the Burroughs' novels, it is a surprisingly well written story and with themes and ideas that would need a complete novel to do them justice. The Bermuda Triangle is never openly mentioned in the film, but is frequently eluded too, and although largely dismissed today, in the 1970s was considered to be an exciting phenomenon and was the subject of dozens of best selling books and movies. As a film, Warlords begins in typical adventure story fashion with the explorers beginning on a seemingly unrelated quest before accidentally discovering the city. Fortunately, enough time is given for the viewer to learn about the characters before the main story begins - the lead characters are rather typical, Aitken is very smart and Collison is more technically minded and strong, however the mutinous and double-crossing crew are more of a surprise and keep the audience on their toes throughout - helping to give the film an unexpected conclusion. Pacing is rather quick, and like At the Earth's Core, there are dozens of interesting plot points brought up that are never covered (What are the 6th and 7th Cities? Where actually are they, and why is there daylight? Why are all the 'slaves' so happy?). The addition of the rubber-suit monsters, although part of the course for a Doug McClure adventure film, does seem rather unnecessary here, and if anything distracts from the more interesting points that the film raises, including the notion of a Metropolis (1926) style culture, with the intellectual elite running the show, with the power to control human destiny, themes that are given far too brief screentime. Whether or not Brian Hayles had planned to explore the themes further in another film will not be known as he sadly died just a few months after the film was completed, while working on John Dark's final fantasy project Arabian Adventure (1979). Kevin Connor has improved his direction yet again and the production is the best of the Doug McClure films. Effective use of matte paintings, and some Maltan landscapes gives the film a real other-worldly feel, while the full size octopus model that attacks the ship looks very effective - the rear projection monsters are still not as good as stop-motion, but are using sparingly here. The underwater shots of the diving bell do look very nice as do the costumes, paticularly of the city's guards. Mike Vickers again provides the soundtrack and gives a very strange score in a lot of scenes, combined with some good orchestral music. Doug McClure is unlikely to win any acting awards, but has good screen presence. There are no big names among the rest of the cast, but all give decent turns, with Lea Brodie playing the boxom heroin. 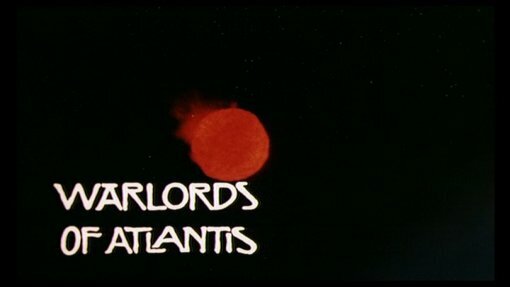 Very cleverly written, although sadly limited by the film's 90 minute run-time, Warlords of Atlantis is boosted by good production and a decent set of performances. Not as fun as At the Earth's Core (1976) but still an enjoyable film, and certainly the most thought provoking of the series. Partly recommended to fantasy and Amicus fans. Directed by anyone interesting? Kevin Connor - a lesser known British director who filmed most of the Amicus fantasy films, and is still working today, recently filming the impressive Frankenstein (2004) mini-series. Any violence/gore? Some death scenes, but nothing violent. Partly recommended to Amicus and fantasy fans - a very well written film. The print is good with strong colours, minimal print damage and mild grain. Audio Original English audio - sound fine. Brief text biographies for actors Doug McClure and Cyd Charisse, director Kevin Connor and Edgar Rice Burroughs. Other regions? Not available on DVD elsewhere (the US rights are held by Columbia pictures). Cuts? The film is believed to be uncut. The print used is English language. Very well scripted, although rather underdeveloped due to the brisk pacing, with good production. Partly recommended. A good looking and sounding DVD, and the only available version at the moment. Light on extras, but probably unlikely to be bettered by a future release, so worth picking up. See our review of the Doug McClure Collection boxset. All text in this review written by Timothy Young - 28th December 2006.